Ever since we lived at the JAARS center in North Carolina just after getting married, Brian has wanted to get into radio-controlled airplanes. I would never let him, because it can be such an expensive hobby. I mean, you spend tons of money to get the airplane, the controller, etc, and then you have to learn how to fly it, right? Of course you are going to crash the thing while you learn, and then what happens to your investment? I thought that by moving to the other side of the world, I could remove him from his dream, but I was mistaken. Turns out there is a thriving club here in Ukarumpa, composed mainly of aviation guys. And then last week, someone offered to sell Brian a really nice starter kit for a low price. He looked at me with those big blue eyes, and I just couldn’t say no. So now he’s got a new pink airplane (he’s not thrilled about the color, but beggars can’t be choosers, right?) and just needs to recharge the batteries before he’s ready to take to the skies. YAY! for Brian. 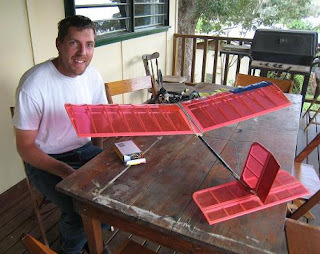 Can't wait to get back to Uka and get my RC glider going as well! Constantly tinkering on something huh? Good ole Brian. nice set of hot pink wheels..I mean wings!